The origin of macaroni and cheese is unknown. The earliest known recorded recipe being scribbled down in 1769. American staple The tasty dish came to America, courtesy of Thomas Jefferson, who, while visiting France became enamored of the pasta dishes served there. He brought back pasta machine and recipes. As president, he served macaroni and cheese at an 1802 state dinner. Kraft Foods introduced its boxed macaroni and cheese in 1937, when America was in the Great Depression. The product served 4 for less than 20 cents. The company sold 8 million boxes of mac and cheese in a yea. During World War II, meat and dairy were in short supply, the box mix continued to gain in popularity. This sea shell mac and cheese is a perfect side dish for any dinner table. The family will love it. Cook pasta according to package directions. Drain well. Place pasta in a bowl; while pasta is still hot add cheddar cheese. In another bowl, combine remaining ingredients, except Velveeta cheese and paprika. Pour mixture over pasta, stirring. Place pasta in a baking dish coated with nonstick cooking spray. 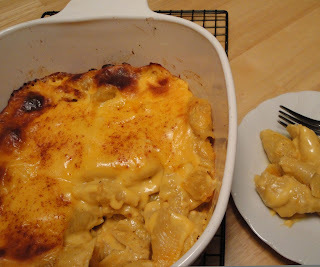 Top with Velveeta cheese and lightly press. Sprinkle paprika. Bake 25 to 30 minutes, until cheese is melted and brown. Enjoy!